In many countries in Asia today, people are celebrating the Mid-Autumn Festival. China, Taiwan, and Korea are officially closed for holidays. Each year, the date is set according to the Chinese calendar and falls on the same day as the autumnal equinox. This is when the moon is supposed to be at its most beautiful being at its fullest and roundness. I look outside on my balcony, but the clouds hide the moon. I won’t get to see the beautiful white moon tonight. In China, I hear the festival is a big event with lanterns, parades, dances and other rituals that date back over 3000 years ago. There are so many legends behind this festival, I wonder which one is true. Is it the one about the moon goddess of immortality and the rabbit, or the one about overthrowing the Mongol rulers? 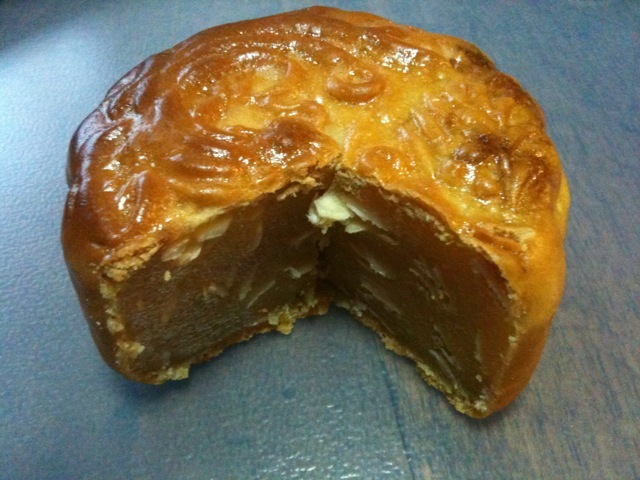 On this day of celebration, people eat mooncakes which I personally love and find absolutely delicious even though I don’t celebrate it. Thinking about it, I have only been aware of these “mooncakes” for ten years since I first moved back to Bangkok. There never was a “mooncake” for me to see in Belgium or the US. Not where I was anyways. If you’ve never had one, I’m sure you’ll find it for sale in Chinatown or a chinese grocery store 🙂 Well worth a try! Wishing you all a lovely Mid-Autumn Festival!